Commemorating the 10th anniversary of President Obama’s first inauguration, the presentation of The Obama Paintings has found a natural home for its first exhibition in Chicago at the Stony Island Arts Bank. Located just a mile from the future Obama Presidential Center, the Stony Island Arts Bank was chosen by President Obama to host the inaugural meeting of the Obama Foundation Fellows last May. 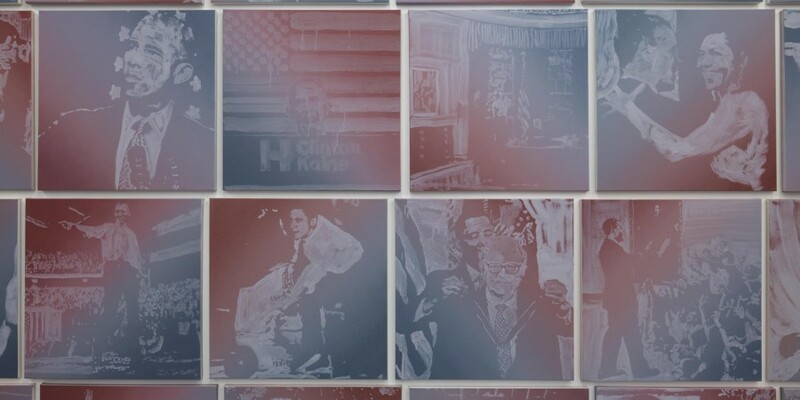 The Obama Paintings document such seminal events as President Obama’s first State of the Union address to seemingly mundane activities like walks on the front lawn with the Obama family dog, Bo. Presented in conjunction with Gavin Brown Enterprise, The Obama Paintings debuts April 18, 2019 and runs through August 25, 2019, at the Stony Island Arts Bank, 6760 S. Stony Island Avenue in Chicago. Stony Island Arts Bank will host programming in conjunction with this exhibition, including an Artist’s talk, workshops, and special performances exploring the relationship between art and civic engagement. The exhibition and all associated events are free and open to the public. Rob Pruitt (b. 1964, Washington, DC) works primarily in painting, installation, and sculpture to create playful reflections on popular culture. His work has been included in numerous museum exhibitions, including a recent exhibition at the Kunsthalle Zurich, Zurich, Switzerland (curated by Daniel Baumann) in 2018; at the Brant Foundation in Greenwich, CT (2015), a 2013 mid-career retrospective at the Aspen Art Museum, solo exhibitions at Dallas Contemporary (2011), Museum of Contemporary Art, Detroit (2015), Freiburg Kunstverein (2012); Le Consortium, Dijon (2002); and group shows such as “Empire State” at the Palazzo delle Esposizioni, Rome (2012), “Pop Life” at Tate Modern (2009), and “Mapping the Studio” at Punta Della Dogana/Palazzo Grassi, Venice (2009). In 2009, he debuted the “Rob Pruitt’s Art Awards,” at the Guggenheim Museum, an award show for the art world fashioned after the Oscars. In 2011, he was commissioned by the Public Art Fund to install “The Andy Monument,” a highly polished chrome sculpture of Andy Warhol (replete with shopping bags) in New York’s Union Square near the site of Warhol’s Factory. Pruitt studied at the Corcoran College of Art and Design in Washington, DC, and Parsons School of Design in New York. He lives and works in New York. Gavin Brown’s enterprise (GBE) opened in New York in 1994 and has since consolidated its position as one of New York’s, and the world’s, foremost representatives of the finest artists of our time. Never wavering from its commitment to the community of artists it belongs to and fosters, the gallery has developed a unique and radical reputation for expanding notions of what art, and art galleries, can be and do today. Gavin Brown’s enterprise has locations in New York and Rome.